It has been more than a decade since the beginning of one of the most severe crises of capitalism. Its most apparent consequence was the degradation of living conditions for the huge majority, in conjunction with the increased dominance of the economy, consumer products and money on more and more spheres of life. However, none of this took place without conflict. A wave of protest and activism has swept the world, rising to challenge this bearing. Under the motto “We are not merchandise in the hands of politicians and bankers”, thousands of individuals with very different political leanings demonstrated in Madrid on the 15th of May 2011. Around twenty of them were arrested that night and another score decided to camp overnight at the Puerta del Sol in Madrid to express their solidarity with those arrested and demand their release. After the camp was brutally dismantled by the police, hundreds came back the following day and soon thereafter many thousands ended up coming together in this very same square. For weeks, the square hosted open assemblies, demonstrations, protest actions and even attempts of self-organization that pointed towards different ways of understanding and doing. This dilated and diverse movement emerged from anger and outrage, but also from hope. It materialized in its first hour with a gesture of solidarity towards those who had been arrested, in response to the abuse and unaccountability of police violence, which in turn proved how those in power feared the movement taking place on the street. The individuals arrested after the 15M were released with charges awaiting trial after 72 hours of being held in solitary confinement. Upon their release, they wrote a statement denouncing the aggressions and harassment they had been subject to, both at the time of their arrest and during the following days in police custody1. The prosecution did not investigate this abuse, nor did any other government institution. Nothing new, on the other hand, this is common practice. Another common practice which was applied here is to change the police report and charges after the fact. The instruction stage of the court proceedings, in which the only evidence consists of the police’s version of events, has lasted years. Even after it was over, several years passed before the court finally decided to set a trial date. In February 2019 (almost eight years later! 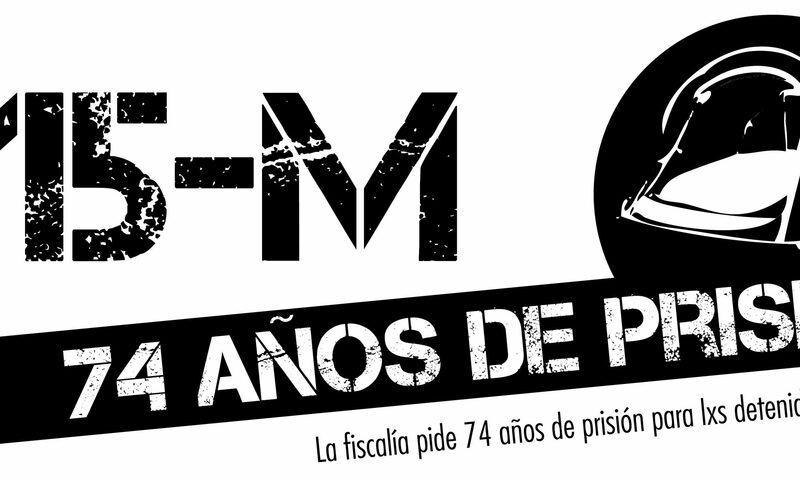 ), 14 of those who were arrested in the 15th of May 2011 face charges of up to 6 years in prison (a total of 74 adding up all of the punishments). They are not the only ones. In Spain, hundreds of individuals are facing long and drawn out trials, with delays of up to 7, 8 or 9 years. In almost all cases, the scheme repeats as if it were a script: violent arrest, aggressions and harassment at the police station, changes in the police version of events… Even though in many cases there are numerous visual documents of the police aggressions, none of them have been investigated ex officio, very few have come to trial, and the police has not been convicted even once. There has been no denunciation of State responsibility, nor any recognition of the harm done (not even in the worst cases such as the murder of Íñigo Cabacas). The aim of this repression is clear: to serve as exemplary punishment. To make sure that everyone knows that demonstrating, protesting, self-organization and any form of social struggle can result in a person being physically assaulted, arrested and imprisoned. This repression ensures a lack of accountability and hides the truth of who it is that truly exerts violence. It creates a climate of fear that discourages any form of political activism, forcing citizens to yield to the conditions imposed by the economy, executed by the governments and shielded by law and police. In this way repression intensifies, the states of emergency expand and the judicial machinery takes action to avoid any hint of new protests, of new forms of self-organization, of any challenge no matter how small or partial, to the world as we know it, as the economical powers allow it to be. But we will not yield easily, much less will we be silenced or enclosed. Against the old and new authoritarianisms, against the repression of social struggles, against the new normality of the gag2, and exception laws, we will always respond with solidarity. If they touch one of us, they touch us all. In February 2019 they we all sit in court. And we will not stay quiet, nor will we stay still. We demand the absolution of the 14 of the 15M and the revision of all the pending court cases. 2This refers to the “Ley Orgánica de protección de la seguridad ciudadana”, which came into force the 1st of July of 2015, commonly known as Ley Mordaza (Gag Law), which together with other measures has contributed to strongly restrict freedom of expression, information and demonstration in Spain (NdT).